Use: Four town house dwellings with on-site parking. 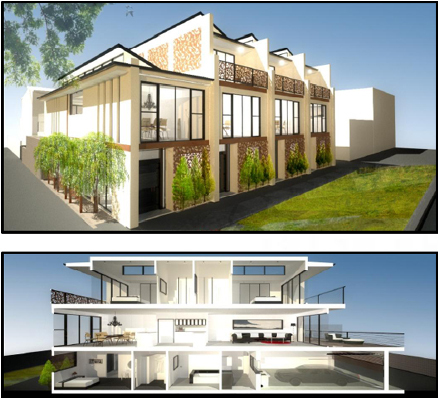 Development: One 2 storey and three 3 storey dwellings. Planning Considerations: Clause 32.01-4 Construction of two or more dwellings on a lot. Clause 43.01-1 Construct a building under the heritage overlay. The original design was refused by Greater Bendigo City Council on grounds related to inadequate car parking, manageable vehicular access and provision of daylight to rear bedrooms. Internal rearrangement of rooms to shift habitable rooms to the front of the development and the laundry to the rear of the development in order to provide more light to the habitable rooms. Bryce Raworth, heritage expert, was retained to provide heritage advice on the proposed development. The amendments facilitated a review by the responsible authority to support the development and the case was decided at a ‘short cases’ hearing in December 2012.